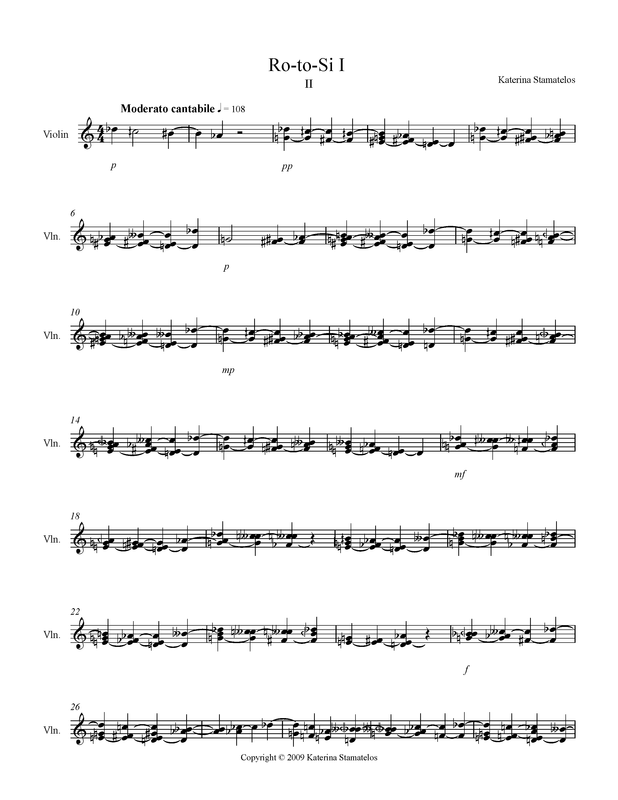 Ro to Si I: a composition for solo violin by Katerina Stamatelos. Ro to Si I, op.19: composed for violin solo (2009). Composition commissioned by: Marco Fusi. Premiere information: Marco Fusi, violin. SoundSCAPE Festival 2009, Pavia, Italy, July 16, 2009. The title is based on an abbreviation of Roads-to-Silence. In this composition, I use a complex structure based on the Ancient Greek/Byzantine music systems originating back to Pythagoras. The speed, extensive use of quarter tones, and general difficulty would label this composition as "virtuoso." However, Marco Fusi ( a highly regarded composer/violinist) put it together within 10 days! His comments were very positive as was the reception from the audience. Unfortunately, I do not have a recording of the original performance. The presentation below (on SoundCloud) was created by using the violin provided by the Garritan Personal Orchestra as embedded within Sibelius. Violin Music: How to Buy My Score! SXISMA Editions is preparing all of my scores for publication! One of its main goals is to publish the so called study scores: these scores will be priced low. The aim here is to reach as many interested musicians as possible! By allowing interested/prospective performers to get an informed look at the score, the publishers hope to make the investment into the performance clearance expense more realistic. The performance of a composition from a living composer requires a music clearance. But what, exactly, is a Music Clearance? Simply put, it is a permission from rights holders to use this particular composition in your production. Proper licensing of music you like can be used in various forms, but always under copyright law: Adaptation, Recording, Reproduction, and Public Performance.